This morning I had a dream that a young woman came to me bearing a key in her left hand. She came to me out on a balcony, I believe, but she walked up to a cabinet where she left the key. I’m not sure where she went. The next thing I remember is that I retrieved the key and walked back into the room from the balcony. It was much like a living room, but no one was inside. I walked through the room, as if I knew where I was going, and through an archway. The adjoining room was small except that the far wall was entirely a large mechanism, much like a big vault in a bank. Somehow, the key was supposed to unlock this large structure. I have no idea what was on the other side. The young woman was of average height, possibly blond, or light brown hair, and thin. She wore a white-laced dress, belted about the waist. Perhaps she is a facilitator of some sort. She said nothing to me and did not acknowledge me, although she seemed to be there for my benefit. My Unconscious was telling me how it wanted me to setup my Active Imagination sessions. It still took me a while to realize that the circular shape of the Iris suggested that it was a yantra/mandala. I’d been wondering how to meditate on my plot mandala, and here was the answer. I could use this circular mechanism, this yantra/mandala, as an entry point into psychic space when I conducted an Active Imagination session to generate material for my own writing. I had read that Jung said mandalas appear spontaneously during therapy. It had happened to me, and I didn’t even realize it. Something seemed to have guided me through all this, revealing bits and pieces of a process one element at a time, building up all the hardware required for the journey into the Land of Story. I view the entrance in the shape of a pentagon, much like the doors of the ancient Krell in Forbidden Planet. Of course, our not-so-friendly dragon, the Ouroboros, circles the door, the plot pentagon. See Figure 8-2 below. When I enter, I envision the dragon to be turned clockwise so that she stimulates the appropriate portion of the plot pentagon. 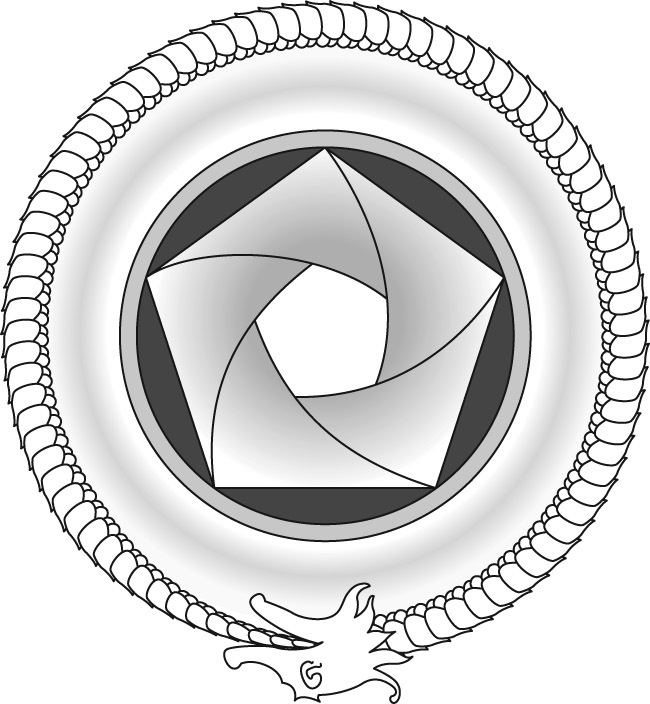 The Iris itself is like the circular leaf shutter of a camera, which opens as an ever-dilating pentagon/pentagram in the center, the expansion of the bindu. When it opens, I step through into the World of the Unconscious. In that way, I enter sacred space, and as such must be respectful of both how I enter and what I do there. Remember that the plot yantra is a mechanism with a sympathetic resonance for a certain portion of psychic energy related to storytelling. Even though this may appear in many ways to be similar to a therapy session, we don’t have a therapist-in-waiting to direct our activities and keep us out of trouble. When Jung first developed Active Imagination, he was on his own too, but he was a psychiatrist. However, you won’t be alone either. You’ll just have to wait a bit to find out about this companion who will help you through this. What’s on the other side of the Iris of Time, this mechanism through which we’re about to step? The first thing our feet touch is the bridge that we call the Transcendent Function. We don’t have a tunnel or a shuttle, but we have that bridge. Of course, the Iris of Time is only one of twelve pentagons that make up the larger three-dimensional structure, the dodecahedron. When we step through the mechanism, we enter what I’ve rather provocatively called the Philosopher’s Stone. This is a divine object and entering it must be accomplished with due respect and proper ritual. It’s like entering a church. Lots of profane activity will go on inside, but the Bible also has its share of debauchery. Since it is a representation of at least a portion of the Unconscious, you’d expect it to be a fairly strange and frightening world. You won’t be disappointed. Why do I need the Iris of Time? Why not just jump right into Active Imagination? My answer is that I could, but just recognizing psychic space as a place to look for images or listen for voices isn’t necessarily enough preparation for entry. Naming my entrance the “Iris of Time” and developing a ritual to get inside makes that sacred space specific, familiar and prepares me for the activity. It provides a demarcation line, a boundary that also gives me the first push into liminality by making me conscious of crossing a threshold and that I have entered an unusual psychic state. In doing so, we should treat that sacred boundary with the respect it deserves. The English “liminality” comes from the Latin limen, meaning ‘doorway’ or ‘threshold.’ Entering a room or leaving it, one crosses a limen, and while there, in this borderline space, one is in liminality, if only for a half second. While we’re within the Philosopher’s Stone, we are straddling the boundary between consciousness and the unconscious, have a foot in each world, so we are in a state of liminality. When we enter Active Imagination just prior to sleep, during the night when we wake, or in the morning, we are at the threshold between the World of Dreams and that of reality, the zone between Consciousness and the Unconscious. In this state, we also tend to throw off our identities and are much more susceptible to taking on different ones, a good thing for writing fiction. We can do much the same thing during the day while sitting alone in a room, but our biorhythms are configured differently, and we are not nearly so close to the Unconscious. I believe both situations have their advantages because in the daytime method, you face more toward the Consciousness side of the liminal zone, and in the nighttime technique, you are facing more toward the Unconscious side. Sometimes it’s better with your intellect in the advantage, and at others, it’s better for it to take a backseat to the Unconscious. Explore all the possibilities; just be aware of the differences and use them to your advantage. This is more than an artifact of culture and is, in fact, a ritual and a show of respect for divine beings who were part of a deeply felt and believed religion. It is Homer’s Code of Conduct. Also note that Homer had done his homework. He had a game plan. In that second quote, he tells the Muse where to begin. You can’t bludgeon your way through this process. My process is different from that used by Homer. And the reason it is is that my Unconscious told me what it wanted. To ignore that request would be to start off with a bad precedent and a show of disrespect. However, I do believe that once you have your psychic space set up and have developed a procedure, the rules of engagement, i.e., Code of Conduct, may be relaxed. This is also the place where I tell you not to be too particular about the purity of the process. It will take a while to become comfortable with Active Imagination, and I still have much to say about how to go about it. It will also take a while for you to understand what your Unconscious wants from you. So sit back, relax, and I’ll give you a few pointers, and the most important problem to tackle is how to get the Active Imagination experience down on paper. The first thing is to make sure you’re in a room where you’re not likely to be disturbed. You then lean back, close your eyes, and clean off a section of psychic space. But here’s the problem. You can’t take a camcorder in with you. You could rely on your memory of what happens and quickly type it into your word processor after the session. I’ve noticed that when I write at night using Active Imagination during my periods of insomnia, the next day I have little memory of what I wrote, or even if I wrote anything. I can’t remember what I wrote until I read it. Since I’m doing this when close to sleep, is it any wonder that I can’t remember it very well? I’m writing while mostly within the Land of Forgetting or the Land of Not Knowing. This is the Unconscious after all, and it’s called that for a reason. So memory is a terrible place to store a session. You could use a voice recorder and talk about what you see and hear. I thought of this, but for me, the sound of my own voice was too much of a distraction. If this works for you, problem solved. You can transfer what you said to a word processor after the session using voice recognition software. If not, perhaps what I have learned is for you. 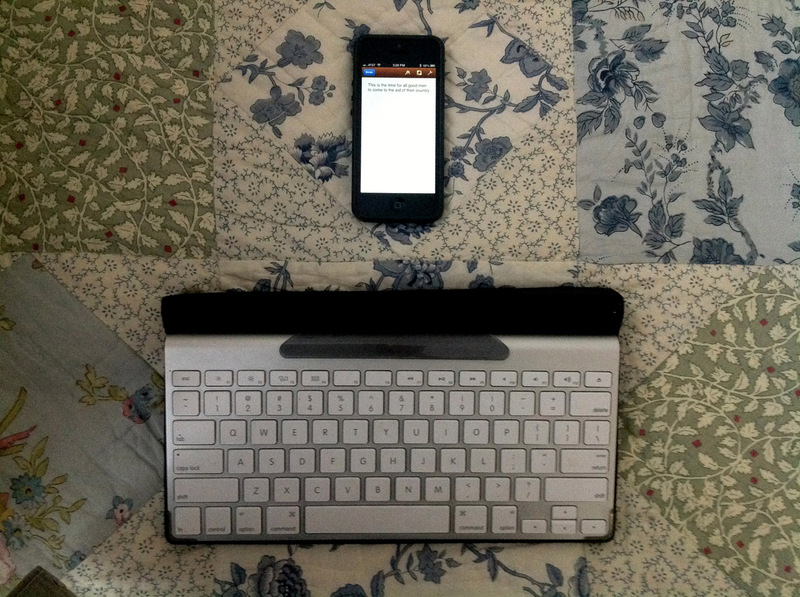 Plus, if you’re writing in bed and have a sleeping mate, you can do it in the dark without making a lot of noise. It’s my solution, but it may be one you can use or perhaps adapt to your situation. I have an iPhone with Apple’s word processor application called Pages. I write primarily during three time periods: (1) when I first go to bed at night, (2) when I wake during the night, and (3) when I first wake in the morning. I’ve also successfully practiced it in the afternoon using a sleep mask. I generate this material while typing blind on a Bluetooth keyboard linked to my iPhone. An iPad would work just as well. What I type shows up in my Pages app, which is linked to the document in iCloud. I cover the iPhone with a book to maintain complete darkness. I edit the material the next day. My Active Imagination sessions are all conducted within the Philosopher’s Stone, which I enter and exit using my Code of Conduct. The good thing about the iPhone is that it wakes up anytime I press a key on the keyboard. It then goes back to sleep when I stop typing. This is also true of the iPad. (This iPhone and iPad behavior may change with future iOS updates.) Granted, typing while involved in Active Imagination is a distraction, and a big one at first. However, after doing this for a couple of weeks, I became oblivious to it. You keep your fingers positioned by feeling the little bumps on the “f” and “j” keys. I put a small piece of tape on the “return” key. The trick is not to care about typos or any other mistakes and just proceed. Editing takes time, but the quality of the material that comes from the process is worth the clean up effort. Another good thing about typing it out real time is that it demands that you focus on each event of the entry process. This keeps you awake. If you’re doing this just before sleep, you’ll frequently drop off into dreamland without accomplishing anything. Typing keeps a portion of the intellect active and enables you to get even closer to the dream state without actually entering. Also, the mind is a quick, nimble entity and wishes to get on with it by zipping through the ritual. Typing out your actions slows the process and allows transitional effects within the psyche to take place. Concentrate on the process and notice the psychic changes you are going through. Don’t remain remote from the process but become emotionally engaged. Ritual may seem mundane, but it is the heart and soul of transitioning to a new psychic state. Don’t sell it short. We are all aware of some of the processes that go on inside the mind all the time. The most universal is what we know as internal dialogue, what we think, and this mostly comes from the ego. The other process is what we know as “the mind’s eye.” It’s practically impossible to have a thought, which we normally think of as words, without an accompanying visual stream. When someone describes a person, house or even a tree, a mental picture immediately comes to mind and matures as you describe it. This is the imagination responding to stimuli. Our task is to jump-start the imagination, and then let it go on its own. The imagination is an ordered but autonomous-functioning part of the Unconscious that steps forward when Consciousness confronts it. Consciousness must be accepting of the Unconscious, or it will not participate at all. The Unconscious is at first incredibly shy and unassuming in the presence of Consciousness, but it may become aggressive, arrogant and intolerant if given leeway. The problem is that the Unconscious does all the hard work, and Consciousness gets all the credit. However, it also may be accepting and tolerant. It just depends on the entity that has stepped forward. Consciousness must be accepting and yet suspicious of this activity within the Unconscious because evil lurks there as well. Consciousness must always be on its guard. Some evil must be dealt with and exploited because it plays a part in the world we depict in our fiction. I’ve found that going into Active Imagination without a definite purpose doesn’t work. At times, I will see images and hear voices, but the encounters don’t go anywhere. Having a definite purpose, as Jung suggests, directly related to what I’m writing enables me to encounter specific psychic entities, view their activities and/or engage them in dialogue. I realize that this may seem a little overly dramatic, but it is a process that has developed naturally for me, and the seeming artificiality of it may be just another manifestation of Consciousness attempting to invalidate the processes of the Unconscious. The ego ever seems to be the enemy of the process as well as always trying to invalidate information from the Unconscious. My experience with Active Imagination has been that proper preparation is crucial for success. The trick then, it would seem, is to quieten Consciousness, direct internal dialogue toward storytelling, and engage for that deeper level of the psyche, the Unconscious, to take over the narrative. Okay. We’ve been there, done that, and now we’re ready to terminate the Active Imagination session. We just open our eyes and walk away. Right? When you go into something with a ritual, you also have to be respectful of how you get out. This is the other half of the Code of Conduct. Going into the Iris of Time properly was crucial, and coming back out is also pivotal, for a couple of reasons. First of all, the exit ritual brings you back out of the liminal experience and allows you to be fully within reality. It terminates the process. It also seems that since the Iris of Time experience is confronting the Unconscious head on, for those who might have difficulty with the Unconscious wishing to flood Consciousness with content, developing a process to turn it off is reasonable and possibly necessary. It could very well help promote better mental health in the face of a powerful but unwieldy creative tool. Again, take your time when coming back through the Iris of Time. Keep typing. Reverse the entry process, and thank the psychic entities that help you come back out. Even a nod will do. They are now your psychic coworkers, even probably your psychic family. I know that this seems unnecessary, but it’s not the act so much as it is the proper configuration of Consciousness relative to the Unconscious that’s important. Tidiness leads to good mental health. It also builds respect for your own precious psychic processes. If you’ve imagined going in, you should imagine coming out and experience it as fully as possible, otherwise you’re not being serious about it. I’ve found that once I’ve made contact with psychic entities, sometimes they don’t want to stop talking, and words and images continue to flood through the Iris even though I thought I had closed it. I suppose this is proof that you’ve built a bridge across the chasm, and you’re using it. So this is not necessarily a bad thing, particularly if you have closed it and started editing the material. Having a close connection with the Unconscious while editing makes for a very creative session. I realize that all this talk about psychic beings as if they are neighbors down the street sounds too literal and strange. It’s just that this metaphorical way of dealing with the Unconscious is the only one available. It’s like dealing with a computer as if it has a desktop, folders, files, and applications, when a computer really only contains zeroes and ones. Even that is one step from actuality because computer memory only has “on” and “off” states. We need the desktop metaphor to communicate with it, to convert its methodology and language into something with which humans can relate. Complex processes within the Unconscious dictate elaborate metaphors for Consciousness to understand. It’s the way we do business together. I suppose it all boils down to the fact that Consciousness becomes lost in the Land of Story. It needs help finding its way everywhere it goes. You’ll become more familiar and confident in that land if you develop the tools and skills to negotiate it. You can use what I’ve learned as a dropping off point, but as time goes by, you’ll be able to develop your own methods. Perhaps your Unconscious will show you the way as mine did me. Now that you’ve finally passed through the Iris, it’s time to check out Storyland.